The seventh edition of the International FCBEscola Tournament presented by Rakuten has come to an end following the four finals at FC Barcelona’s Miniestadi on Thursday. The final day demonstrated the high level of skill and camaraderie on display among the 1,900 boys and girls who took part representing 45 FCBEscolas and FCBCamps, from 22 countries, across all five continents. The day ended with the prize giving hosted by the FC Barcelona Director Pau Vilanova; the director of the FCBEscola project, Carles Martín; and the first team player and sponsor of the 2018 edition, Sergi Roberto. FCBEscola Barcelona dominated this edition as they provided five of the eight teams to play in the four different age group finals. As was the case last year, the home school were able to win the trophy in the U8 and U10 age categories. The former saw the FCBEscola Barcelona Blau defeat FCBEscola Barcelona Grana 3-0; and the U10s ended with FCBEscola Barcelona Grana defeating FCBEscola Barcelona Verd 4-1. In the older categories, there was little to choose between the finalists and both of the finals were decided by penalty shootouts. The U12s final saw the FCBCamps Italia team come out on top with a 3-2 win, having played out a goalless draw. The U14s saw the FCBEscola Perfeccionamiento Tenerife level the tie 1-1 against FCBEscola Barcelona Blau, before winning the shootout 4-3. The team from Tenerife made up for last year’s final defeat in the same category against the FCBEscola Río de Janeiro. A total of 572 games were played, which was a considerable increase on last year’s total of 457 games. 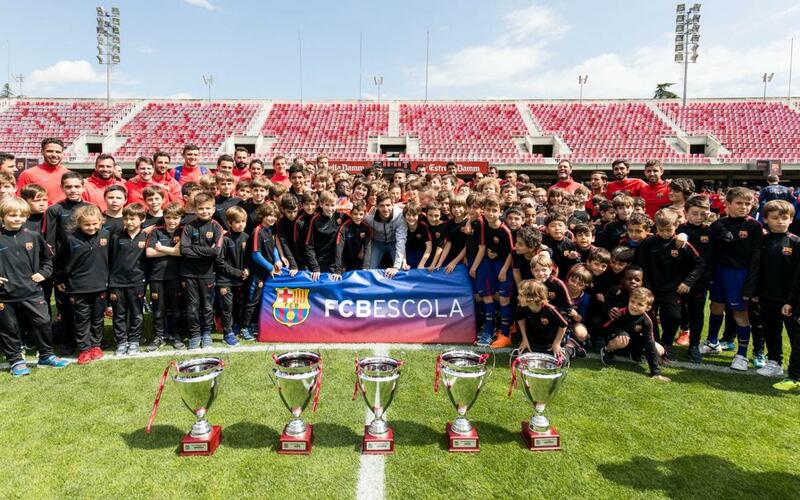 Other noteworthy statistics are that the U8 category has only ever been won by a team from the FCBEscola Barcelona, and that FCBCamps Italia and FCBEscola Perfeccionamiento Tenerife have secured their second ever win in the tournament. Interestingly, they have both won the same category, U12 and U14 respectively, on each occasion.